• Fitted with user friendly, high quality electronic lock programmable with user's own code. Override keys supplied. • When bolted to a wall provides defence against burglaries aimed at stealing car keys, house keys etc. • Ready prepared for fixing to the wall with bolts supplied. • Key deposit slot allows keys to be deposited without the need to open the safe. • Supplied complete with selection of coloured key rings. 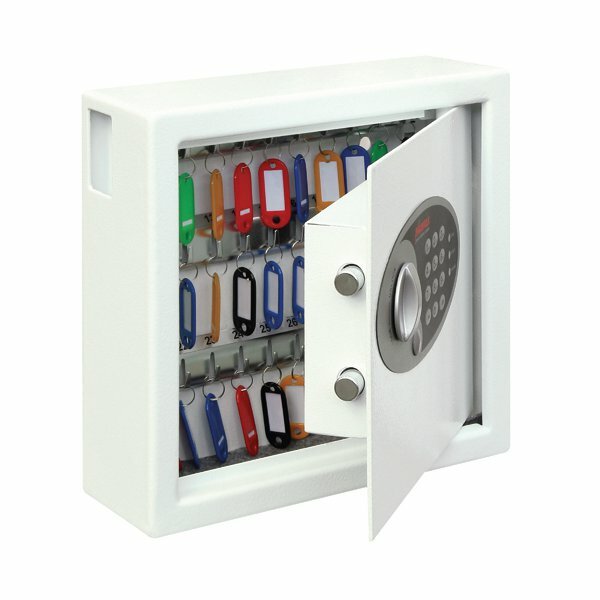 This heavy duty, high security key safe can hold up to 30 keys and comes with a user friendly electronic lock, which can be programmed with a user own code. 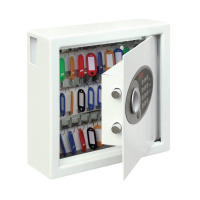 Ideal for retail, office and home use, the key safe can be bolted to the wall with the fixings supplied. The safe is finished in a high quality, scratch resistant white paint and measures W300 x D100 x H280mm. The safe also comes with 2 override keys.